Kilnaughton Chapel, Kilnaughton. View of inscribed panel in churchyard wall. 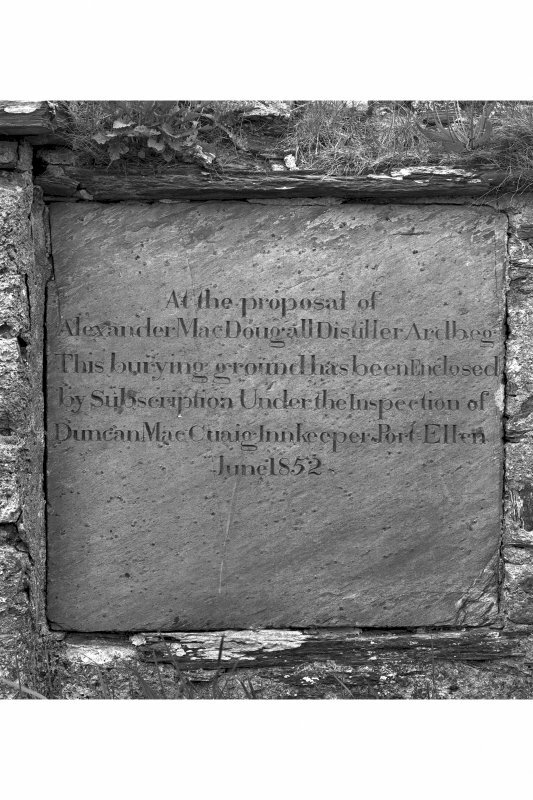 Insc: 'At the proposal of Alexander MacDougall, Distiller Ardbeg, this burying ground has been enclosed by subscription under the inspection of Duncan MacCraig inkeper, Port Ellen. June 1852'. 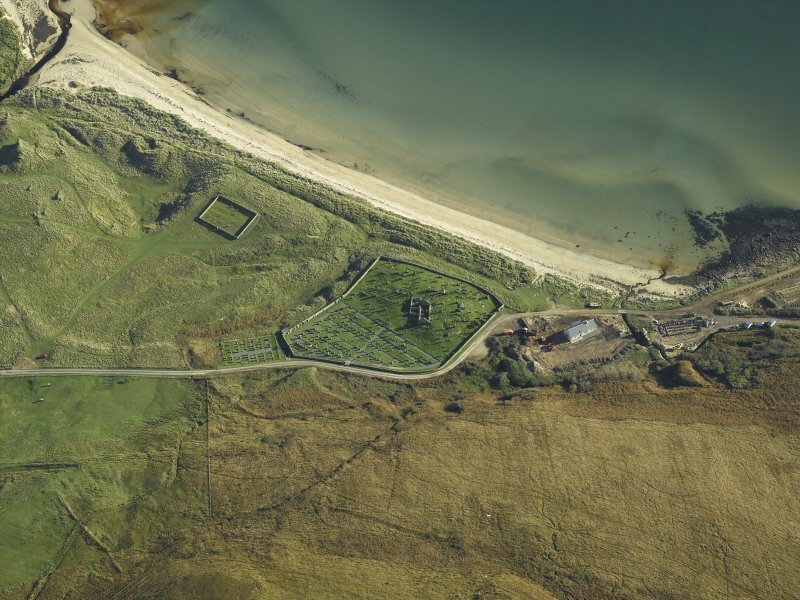 Oblique aerial view centred on the remains of the chapel and burial-ground, taken from the SE. 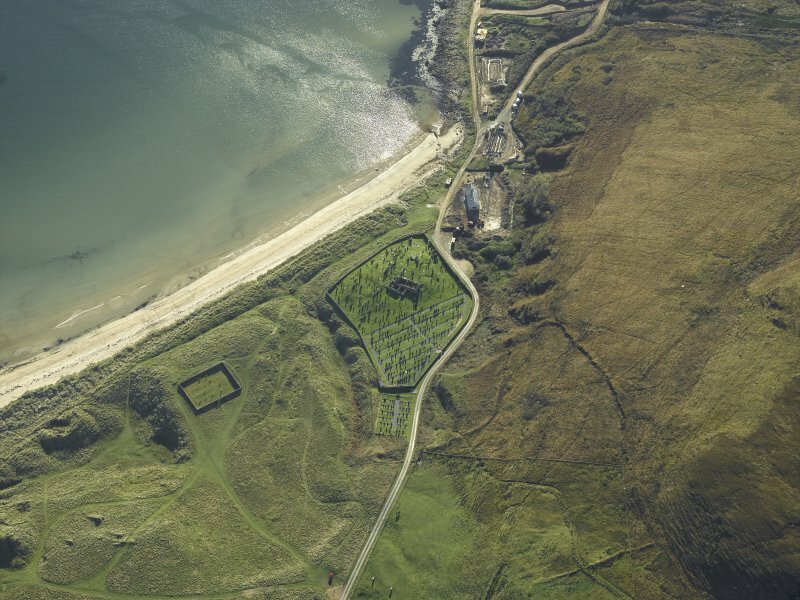 Oblique aerial view centred on the remains of the chapel and burial-ground, taken from the NW. Kilnaughton Chapel and Burial Ground, Kilnaughton. 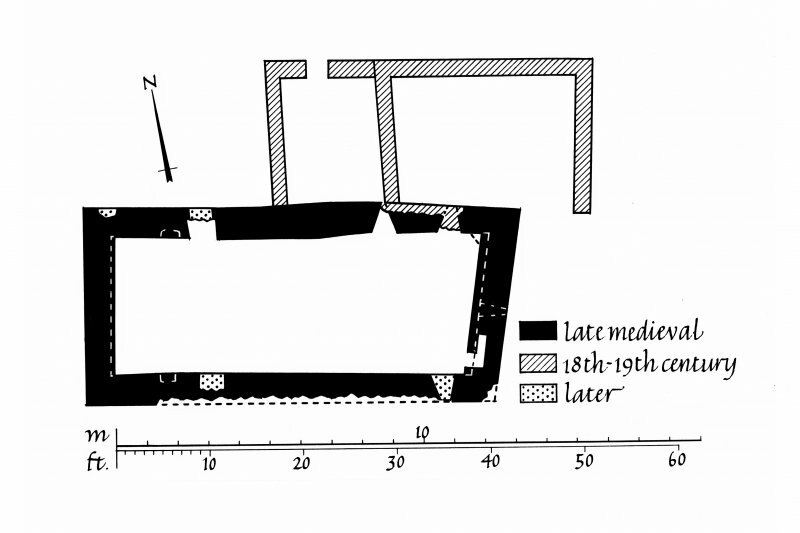 Photographic copy of plan with walls shaded according to date of construction. 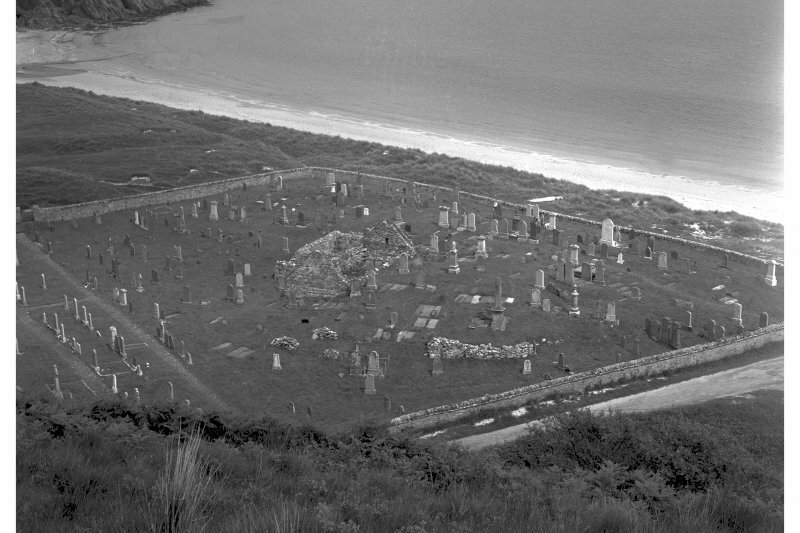 Oblique aerial view centred on the remains of the chapel and burial-ground, taken from the W.
West Highland Effigy (KK1), Kilnaughton Old Parish Church. View of effigy from above. Kilnaughton Chapel, Kilnaughton. View from West South West. 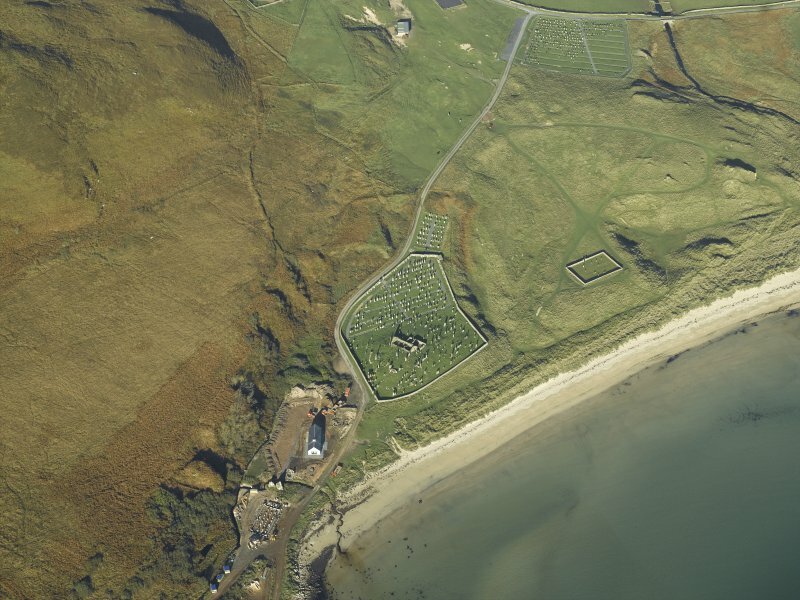 Oblique aerial view centred on the remains of the chapel and burial-ground, taken from the SSW. 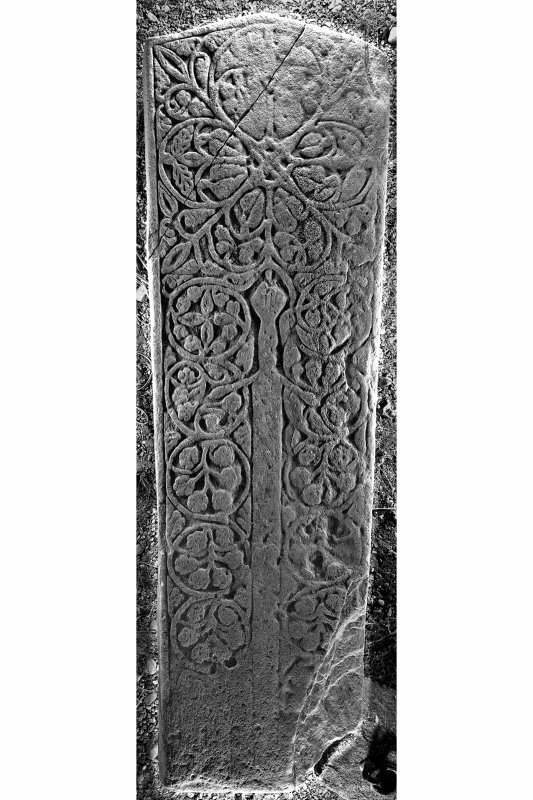 West Highland graveslab (KK4), Kilnaughton Old Parish Church. View of graveslab from above. Kilnaughton Chapel, Kilnaughton. View from South West. The remains of a Medieval chapel, almost certainly 15th century although the east end may date from the early 13th century and the name Kilnaughton, for Cill Neachdain, Mechtan's Church, probably commemorates the saint of that name who died in 679 and suggests an early foundation. The building, which was half buried in sand in 1895, measures 37ft 8ins by 15ft 2ins internally. The west end is blank and there is a small, narrow window in the east end. Graves occur both inside and outside the building and there are at least 4 sculptured slabs, proabably all 15th century in the interior. 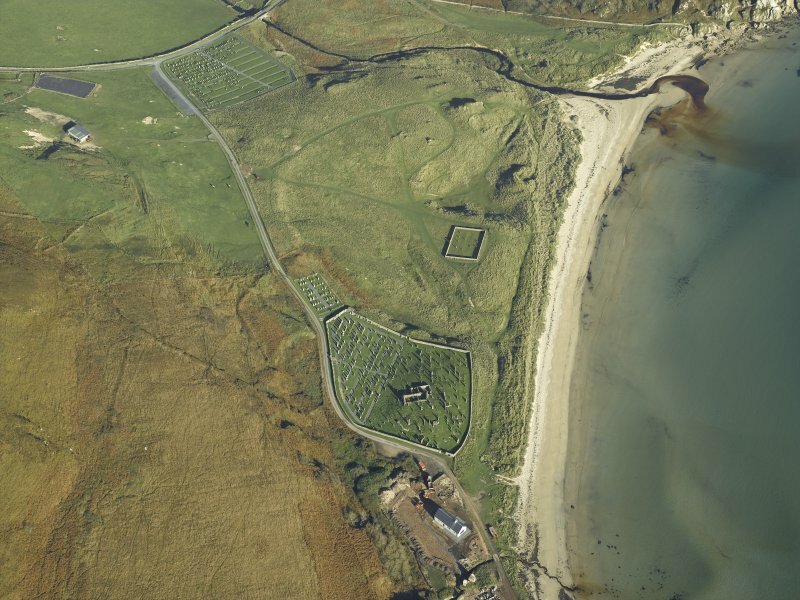 Air photographs appear to show the original outline of the burial ground. R C Graham 1895; D MacGibbon and T Ross 1896-7; W J Watson 1926; Information contained in letter from W D Lamont 2 October 1957; W D Lamont 1972.
corner shelves. The height of these shelves in relation to the adjacent windows suggests that the E end, or chancel, of the church was floored at a higher level than the nave, an arrangement also found at Kilchiaran (RCAHMS 1984, No. 365). At the W end of the building the existence of a pair of opposed socket-holes in the side-walls may indicate the former existence of a gallery or laird's loft. The church is probably of late medieval date. and a plant-scroll to the left. lona school, 14th century. wearing a cap with a prominent roll at base, together with a pair of shears and a ?book (Graham, 1895). lona school, 14th-15th century. armpits. The remainder of the slab is decorated with an overall pattern of intertwined plant-stems. (Graham, 1895). lona school, 14th-15th century. to that on number 4, except that the plant-stems flanking the sword are of undulating type, and above the cross there is a mounted figure. The border consists of double roll-mouldings enclosing a row of nail-head ornament. (Graham, 1895). Probably lona school, 14th-15th century. tip of a sword-blade flanked by plant-stems, 14th-early 16th century. The following stones are in the burial-ground. (7) A recumbent slab inscribed at the head D MCL/1694. The third numeral has been altered from '6' to '9'. (9) Tapered slab inscribed CD/l684at the head. ( 10) Slab inscribed A McI /1725 and with plain margin. (12) A much-worn recumbent slab bearing an almost illegible five-line inscription containing the date 1733.
embattled; 2nd, gyronny of eight; 3rd, a chief cheeky (?in error for a fess cheeky); 4th. ?a hunting-horn. charged gyronny of eight; the crest is a galley with sail furled. fess three ?buckles; 4th, a galley with sail furled. RCAHMS 1984, visited September 1975. The roofless chapel, dimensions as stated, has east and west gable ends standing to full height and tumbled north and south walls to an internal height of 1.3m. Two later burial enclosures are built against the north wall. 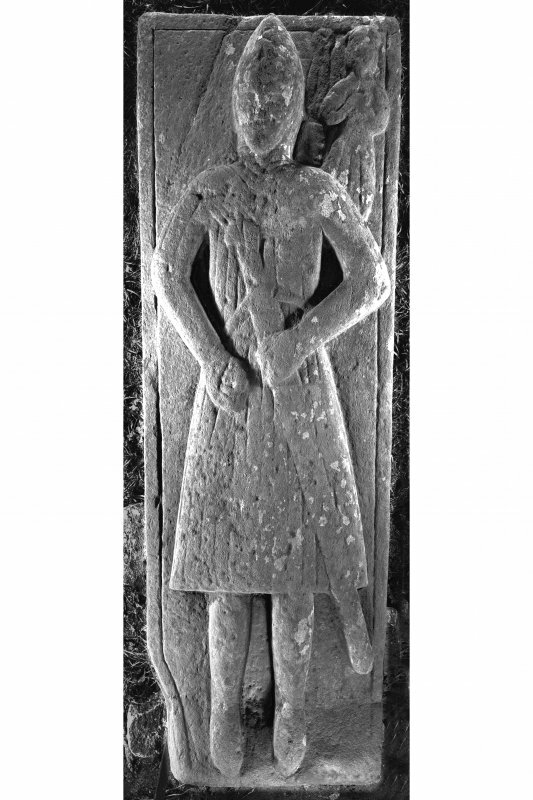 There are several recent burials in the undivided interior, as well as the suggested 15th century carved slabs in the eastern half. The burial ground is still in use and has been extended westwards. 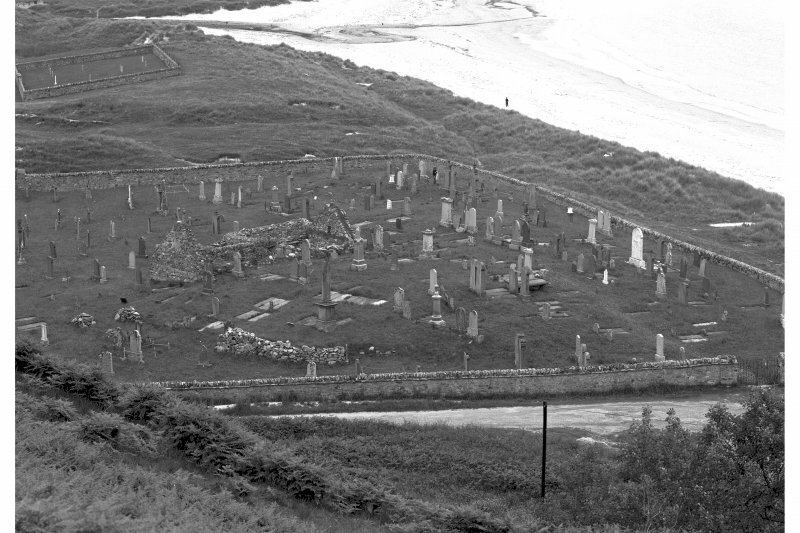 Its original size is indicated only by built up undulating ground around and against the chapel, with 17th century and possibly earlier grave slabs. No evidence of a pre-Medieval structure or enclosure was found.